"I remember when we did drag J.J. on up there [onstage], Benny Carter said, 'Go ahead, man, play something.' And he's sweating and scared to death. Man, he turned 'Body & Soul' inside out." It was not until the summer of 1955 that J.J. Johnson, name band musician and soloist respected and imitated during the past decade by innumerable performers all over the world, finally won a Down Beat poll. In informed quarters there were audible murmurs of "About time too"; in other sympathetic hip circles the reaction was "Better late than never." 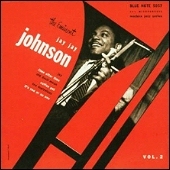 Blue Note record fans were way ahead of the critics who awarded Jay Jay this belated crown. The amazing young trombonist has been an important part of the Blue Note catalog ever since his first appearance years ago with Howard McGhee's All Stars on BLP 5012. He was heard as sideman with Miles Davis on 1501 and 1502 and with Kenny Dorham on 5065 in addition to appearing as a leader in the three outstanding sessions listed and described below. The place of Jay Jay Johnson in jazz history parallels that of Dizzy Gillespie and Charlie Parker on their respective instruments. He was the first, and by all odds the foremost, of those who showed in the mid-1940s that it was possible to translate the rhythmic, melodic and harmonic innovations of bop into terms of that cumbersome and not too easily manipulated instrument, the slide trombone. Jay Jay earned his nickname from his fist and last initials: he was born James Louis Johnson. A native of Indianapolis, Indiana, he showed his first musical talent as a pianist in 1935, when he was eleven years old, and took up trombone three years later. After working with Clarence Love and Snookum Russell in 1941-2, he acquired his first taste of widespread recognition as a member of he Benny Carter band, with which he toured from late '42 until '45 (Max Roach was a member of the orchestra during this period). When Count Basie decided a new sound was needed in his trombone section, Jay Jay was the one who instilled it, for several months in 1945-6. Then came a long period of free-lancing with various combos in the hectic whirl of the jumping Fifty-second Street of those days. 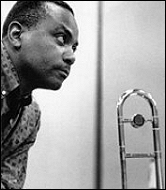 Jay Jay free-lanced with Dizzy Gillespie, Woody Herman and a flock of bop units. For more than a year he was on the road with Illinois Jacquet's band. By this time Jay Jay was the acknowledged king of his style in modern jazz circles. A board of critics and musicians assembled by Esquire had elected him the new trombone star of the year in 1946. Before long his fame had reached international proportions. With the advent of war in the Far East, Jay Jay teamed up with Oscar Pettiford in a USO unit that entertained the troops in Korea and Japan. On returning home, though, Jay Jay found that the bottom seemed to be falling out of the music business. The pickings were so lean during the next few months that in August, 1952 he took a job as a blueprint inspector at a Sperry factory in Long Island, limiting his musical activities to an occasional one-night gig or record session. Then things began looking up again, and in June 1954 Jay was able to give up his daytime chores to return to the occupation for which his talent and years of patient practice had originally designed him. "Coffee Pot" [mp3] from 1954. He has worked pretty steadily since then, often in partnership with Kai Winding. During all the ups and downs he has never lost the esteem in which jazzmen and fans always held him. Eminent Jay Jay Johnson, Vol 1. 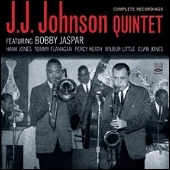 A selected discography of J.J. Johnson albums. J.J. Johnson Jazz Quintets, 1946, Savoy. The Eminent J.J. Johnson, Vol. 1, 1953, Blue Note. The Eminent J.J. Johnson, Vol. 2, 1954-1955, Blue Note. Quintergy: Live at the Village, 1988, Antilles. Standards: Live at the Village, 1988, Antilles.